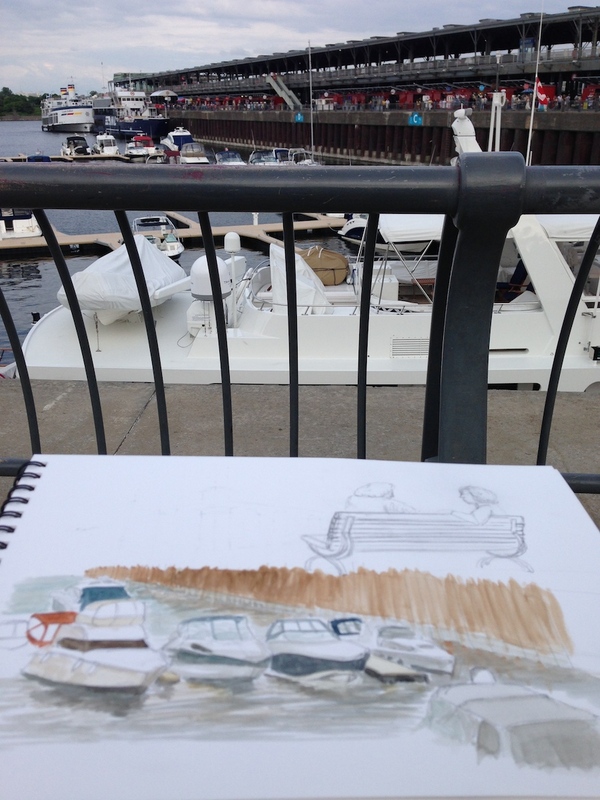 I met up with a fellow urban sketcher at the old port of Montreal to capture a couple interesting sights. 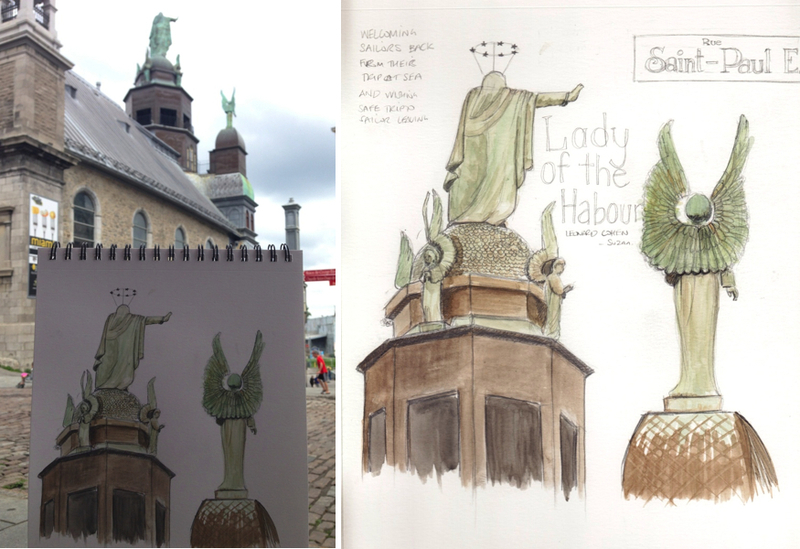 Our first stop was on St-Paul E street at the corner of Bonsecours, looking at the back of the Notre-Dame-de-Bon-Secours (Our Lady of Good Help chapel, also known as the Sailor's Church). One thing that caught my eyes was the back of the statues above the chapel. I really like the shape of the angels' wings, it was the detail that got me started on this sketch. This chapel is one of the oldest churches in Montreal. I overheard a tour guide say that the reason the Lady of the Harbour has her hand up towards the St-Laurent river was to protect the sailors during their long trip from or back to Europe. It was most likely a very difficult voyage at the time. 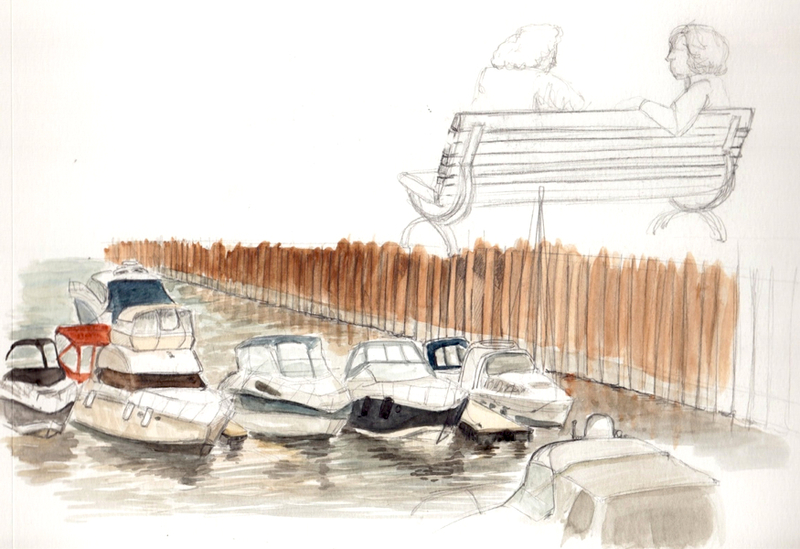 We then headed over the the harbour and sketched some of the boats parked in the port. The site is quite different than what it used to be back in the 1600s.-1700s. All the boats in the harbour are very modern with many amenities that the colonizers back in the day would have greatly benefited from. I can't imagine how taxing it must have been to sail across the ocean in their little ships. I think something that would be a great addition to the harbour would be to have life-size replicas of some of the first ships that came into the harbour back in the days.